Irritability or Anger- Children who are depressed lash out at others. They become angry easily. Sometimes they are aggressive. Outbursts and/or Crying– This is related to irritability and anger. Perhaps your child is shouting or yelling often. And/or they are crying at what seems like the drop of a dime. This is because the complex feelings of depression they have are confusing to them. Furthermore, shouting or yelling is the result of them looking for something to latch on to in order to explain those feelings. To your child, a simple request that may be slightly annoying when they are not depressed, may be playing into a narrative for why they are depressed. More on this later. Social Withdrawal– Suddenly your child does not like their friends. They don’t want to hang out. And they may become irritable or angry with you if you try to force the issue. Change in sleep/energy– Is your child sleeping more? Or, is your child sleeping less? Changes in sleep patterns are a tell tale sign of child depression. Related to sleep is level of energy. Does your child appear sluggish and complain of being tired despite getting more than enough sleep? Difficulty concentrating– Your child has a hard time concentrating on tasks that once were easy. You find yourself redirecting your child often to complete certain tasks. This may be present in the academic setting. It may also be present at home. Read more about childhood depression symptoms here. If you have read any of my posts in the Nothing is Real series, you may have a sense for where I’m going next. Of course what a child who has depression is feeling is real. However, I want to challenge us to think outside the box a bit about how we conceptualize their behaviors. As mentioned before, children have a slightly more difficult go at it when it comes to mental health issues. This is because their brains are still developing. As a result, they may or may not have reached certain developmental milestones that would assist in their ability to articulate how they are feeling. Unfortunately, the result of this could be that a child is depressed for an extended period of time before help arrives. In that span of time, perhaps they are labeled in various not so positive ways. It happens often. Children who are depressed and are displaying the more difficult behaviors such as outbursts and aggression are talked about in terms of their negative behaviors. Adults gather in meetings to discuss behavior, interventions, and ways to support the child. Parents and teachers who are trying to be aware of how they speak in front of the child, tend to be more lax the older the child. This is because we expect the child to take responsibility for their actions. Therefore, we have no problem telling them that their behavior is unacceptable, inappropriate, and that they need to change. Don’t get me wrong, these are all helpful concepts for a child to understand and incorporate into their value systems. However, I have found that when perceptions and as a result perspectives shift around what is going on with the child-positive change happens quicker. So, if we conceptualize a child’s experience of depression based off of what we know we should be able to tailor more helpful interventions. 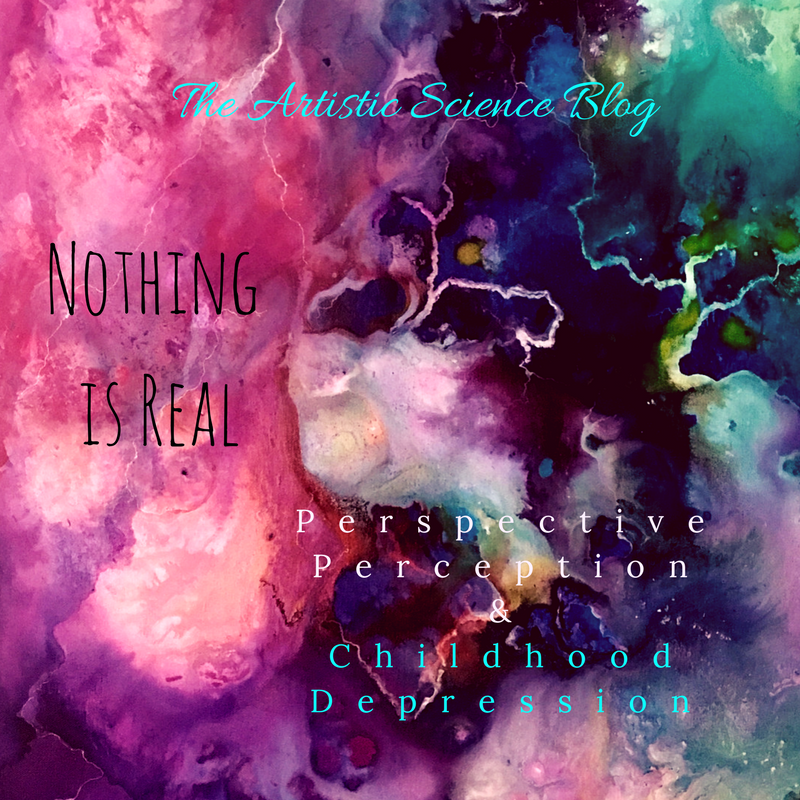 Given what we know about how different depression looks in children, I maintain my stance that nothing is real. This is such a clear cut example. Why? Because, the perception of what depression is supposed to look like plays a role in the perspective of adults who are around depressed children. As a result the childhood depression experience is significantly impacted. My work as a therapist with children is both with the child and their family. So, I spend a lot of time explaining to the parents that what they are seeing is not intentionally defiant and difficult behavior. Instead, it is the behavior of a child trying to make sense of the world, while making sense of who they are, while simultaneously being mired down with complex emotions (childhood depression) that don’t seem to have a purpose. I do this in front of the child. Why? Because they need to know that someone understands, and that their caregivers understand too. In the abstract art example I keep coming back to I conceptualize childhood as the beginnings of the art piece. The parents are the artists, and they are creating this person (art piece). It starts from nothing, and becomes something. A human being, a work of art, separate from but also a reflection of its creators. At some point, the art piece start to take on a life of its own. As the child gets older, they become less dependent on the parents. Despite their burgeoning independence, they don’t always know who they are or who they want to be. As the parents (artists) you may have a vision for how your child experiences life. In this case happiness is usually something parents wish for their children. But, perhaps the materials you are using aren’t conducive to that vision. Often times this is of no fault of your own. Just the result of a limited perspective based on the fact that you are human! Sometimes though, all that needs to happen in order to make the art piece the best it can be, is for you to stand in a different part of the room. There, you may be able to see what you couldn’t before and thus your work can begin again. Having a child who suffers with any social, emotional, or behavioral issues is never easy. Childhood depression in particular poses a significant challenges to many families. But, having a therapist walk along side you, and your child, cheering you on as you try new things could be just what you need to make the positive changes you imagine come to fruition. Up Next for Nothing is Real: A Conclusion to part 1 of the series. Coming your way next week!